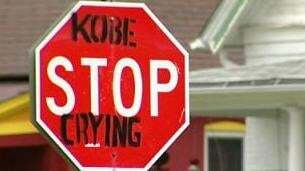 A Denver hooligan went out on a two-block strip to deface some innocent stop signs after the Nuggets lost Game 1 to the Lakers last Tuesday. It is not known whether this hooligan acted alone or whether he was part of a larger hooligan conspiracy. He is still at large. 9NEWS doesn't condone the defacing of public property, but we do appreciate the sentiment displayed on stop signs in Denver's Baker neighborhood. That's a wrap for today. I'll be back tomorrow, hopefully with some more substance, and we'll do this whole thing again. Thanks for your continued support of Deadspin, and for not hiding when the new guy showcases his ineptitude.